Will it be second time right? Luckily for ZTE the world didn't end today, but it wasn't bold enough to launch a phone with a new ZTE Nubia Z5 release date now on the cards. Yesterday we reported that the Chinese firm was planning a dooms-day unveiling of the 5-inch, full HD Nubia Z5 but it looks like the tipsters have gone the way of the Mayans with their prediction skills. 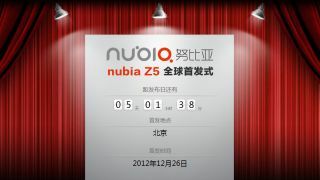 The official Nubia website now has a fancy countdown clock, informing us that the super-sized phone will arrive in 5 days times – on December 26. Thanks to the official website we can now be sure the Nubia Z5 is the real deal, although specifications, price and availability are still a mystery. The latest reports suggest the handset will sport a 1080p HD display, 1.5GHz quad-core processor, 2GB of RAM, 13MP rear camera and 2MP front camera with Android Jelly Bean running the show. We expect to get hands on with the ZTE Nubia Z5 at CES 2013 which kicks off on January 8 in Las Vegas, where we'll bring you all the details along with news on the ZTE Grand S.